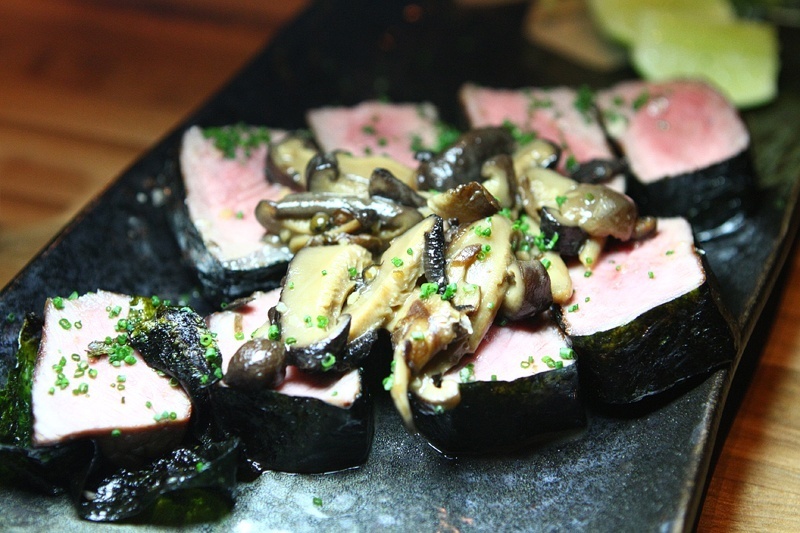 The new Yusho Japanese Grill at Monte Carlo makes it easy to decide what’s for dinner with its “Omakase” prix fixe menu. Omakase means “to entrust,” which means you’re putting your faith in the chef to decide which items you’ll get in your six course meal. If you love Japanese food (and even if you don’t yet), it’s an indulgence you’re likely to find well-worth the $99 price tag. Yusho means “victory” or “championship” in Japanese. According to the Internet. Which is always 100% reliable. The Omakase menu is broken up into sections: Classics, Grilled, Noodles, Pickled, Fried, Steam Buns and Sweet. You basically get a dish from each of the sections, although we’re happy the chef decided to skip the “Pickled” section during our visit. That just sounded weird. Before we get to the food, here’s a little more interior design action. First up was an heirloom tomato salad. Which we’re pretty sure wasn’t on the menu, but which everyone seemed to enjoy. Chef, if we could veer away from the healthy stuff, we’d appreciate it, thanks. Next up was pork shoulder, with kimchi and cilantro, on a steamed bun. 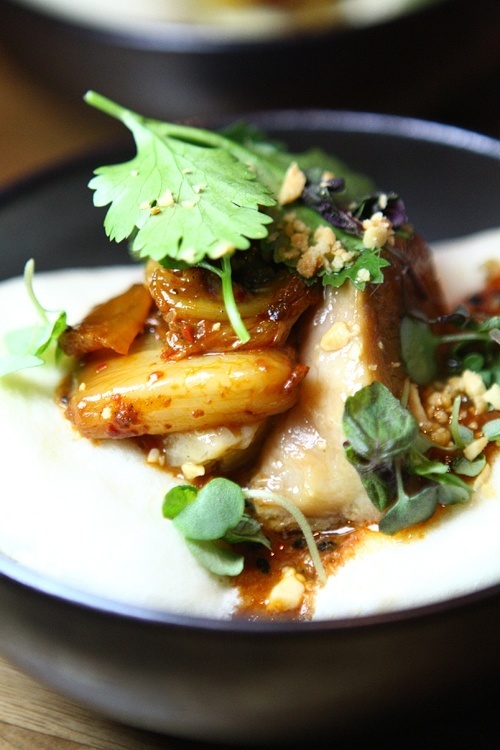 We’d say it was a bao bun, but those are Chinese, and we’re confused enough by the various cultural fusions at Yusho as it is. The cod version was also lovely. Although probably less so for the cod. 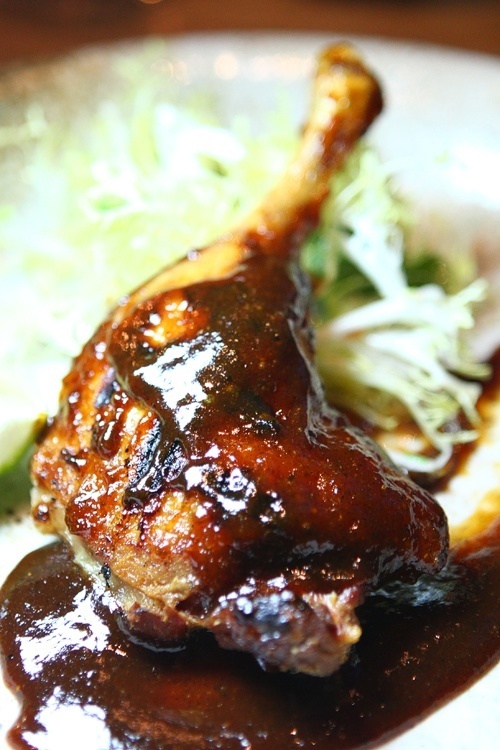 Then emerged from the kitchen a fried duck leg drenched in an amazing plum barbeque sauce. Best thing on the menu at Yusho. 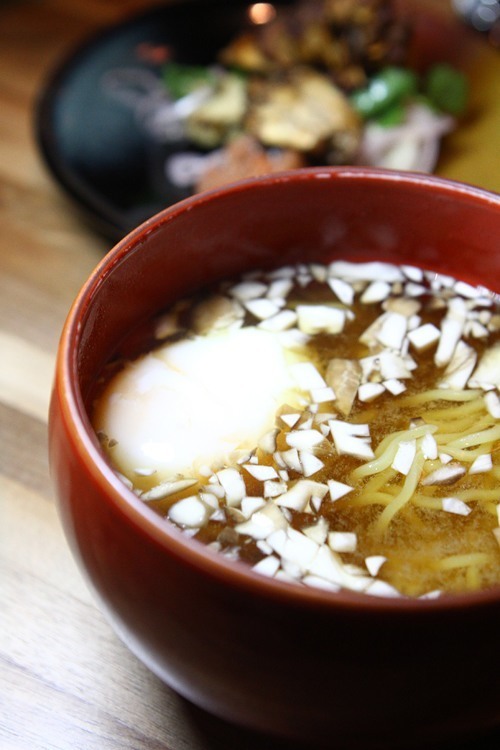 From the Noodles section of the menu, we had the Maitake Ramen. You know, soup. The soup was quite delicious despite there being an egg in it. Part of the fun of the Maitake Ramen is the stuff you get to add to it. Including, wait for it, maitake mushrooms (see below). 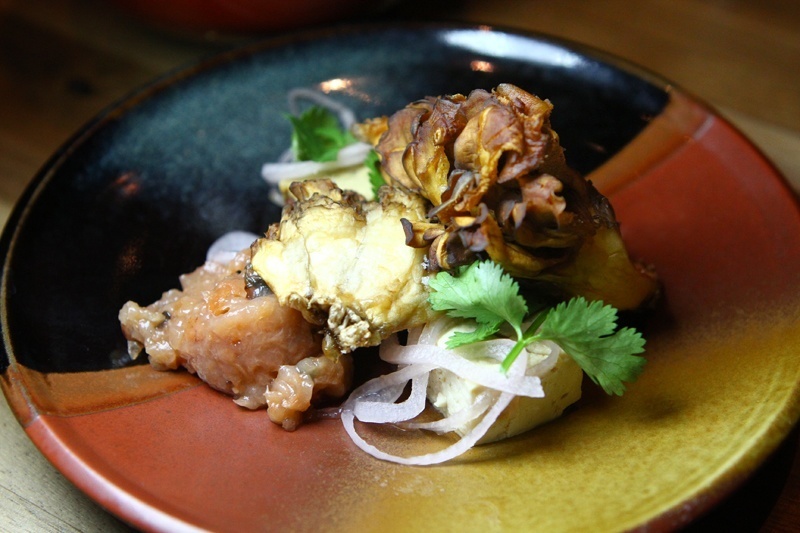 Maitake mushrooms are also referred to as “hen-of-the-woods,” “ram’s head” and “sheep’s head.” This mushroom was clearly given its nicknames during a time when people weren’t as swift. Although the portions are relatively small, by this point in the meal, you begin to approach the wall. Still, you don’t feel like you’ve gorged yourself at a buffet. The fare is light and fresh and bursting with new and interesting flavors. But wait, there’s more. The meal got serious when two grilled items arrived, the New York Aged Strip Steak (with mushrooms and peppercorns) and Hamachi Kama, probably some sort of fish. A most excellent steak, although the seaweed was weird. Added a little surf to the turf. 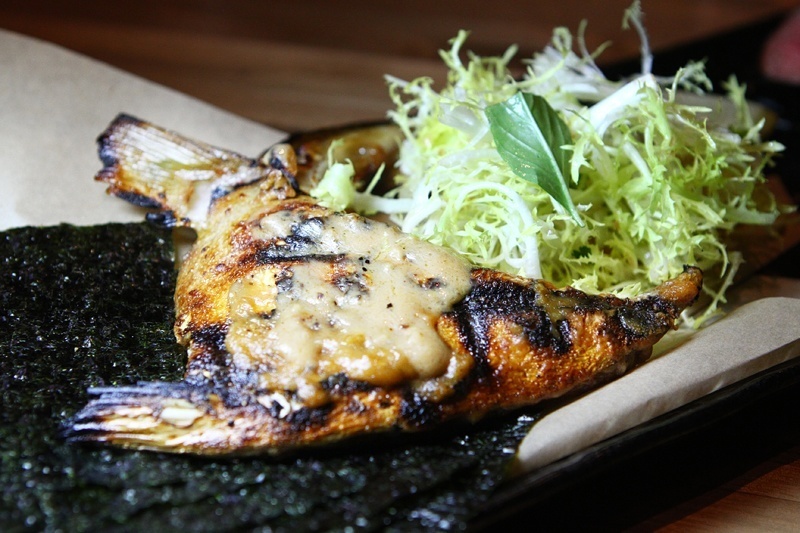 Hamachi kama means “yellowtail collar,” which is apparently the best part of the fish. Truly exceptional, even though we’re not a fish person. It was time to move into the dessert portion of the evening. One of the best parts of visiting a restaurant with a group is you get to try everyone else’s dessert, so that’s what we did. 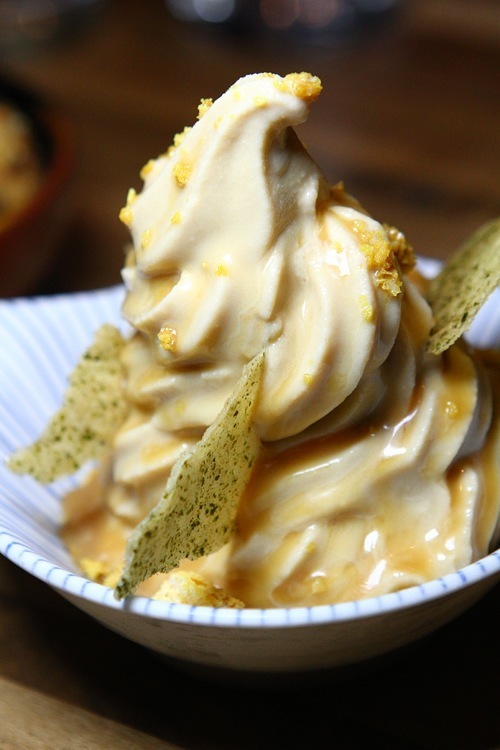 There was the soft serve, topped with fernet caramel. Fernet is an aromatic spirit. Isn’t it adorable how we pretend to know things off the top of our head, as if we didn’t just Google them? Asking for permission to try someone’s dessert is so 2005. They’ll forgive you. 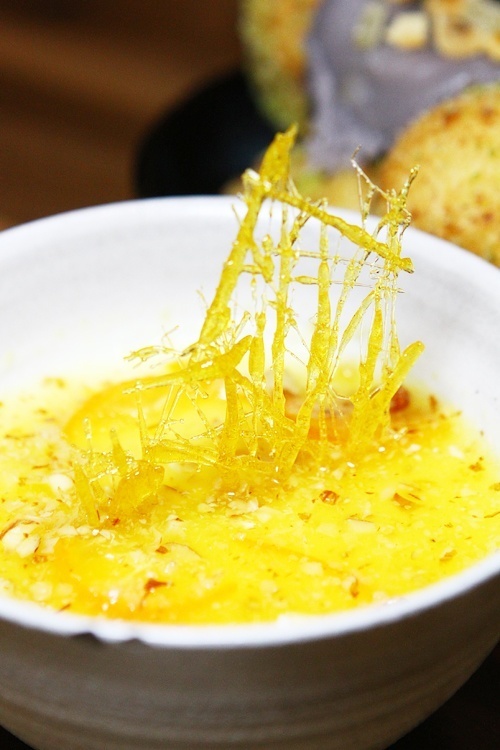 Yusho’s panna cotta dessert has curry, honey and citrus. Panna cotta is cooked cream. It tastes better than that sounds. Finally, there are doughnuts (yay, back in our comfort zone). The donuts have tofu (back out of our comfort zone! ), sweet potato and rosemary. The final leg of our whimsical culinary sojourn. Makes it sound fancier, right? In the end, Yusho had more than earned our trust. 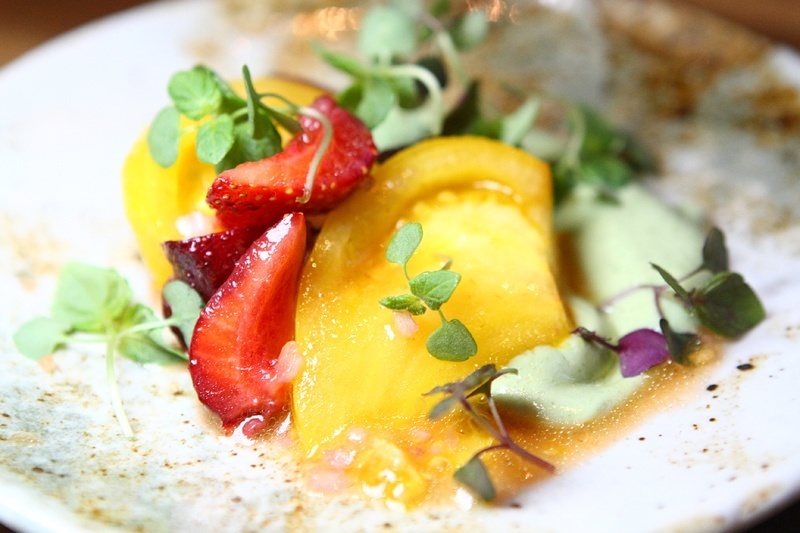 The service was great, the space is welcoming and mellow and the food was memorable. What more could you ask for of a night out in Vegas? 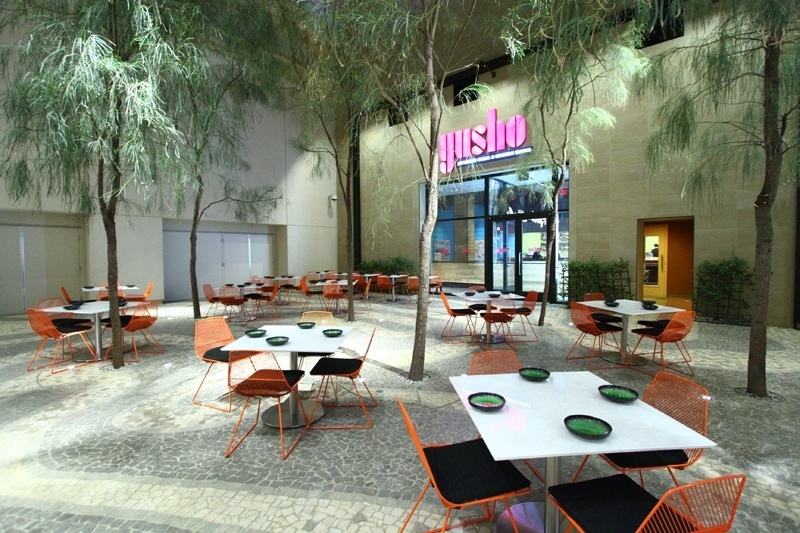 Patio dining is also available. There’s often free entertainment nearby, as well as world-class people-watching. 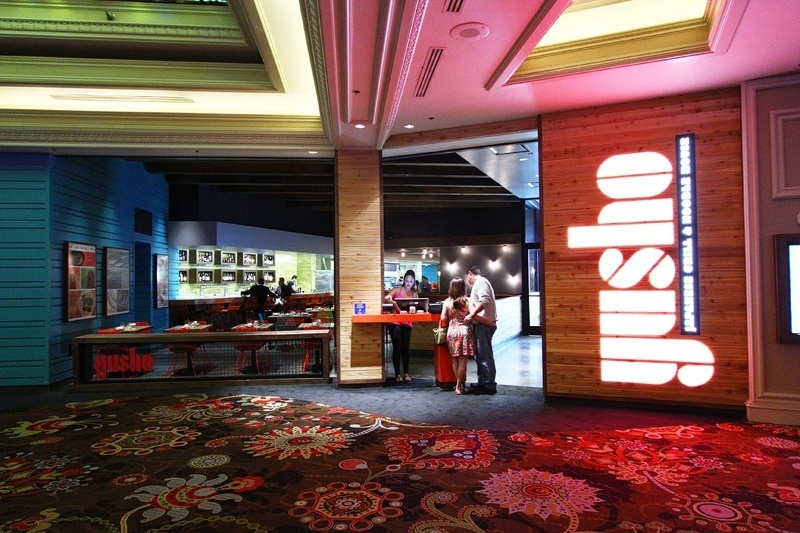 Our friends at Eater Vegas have an interview Yusho’s Executive Chef, Matthias Merges. Worth a look. The chairs are more comfortable than they look. 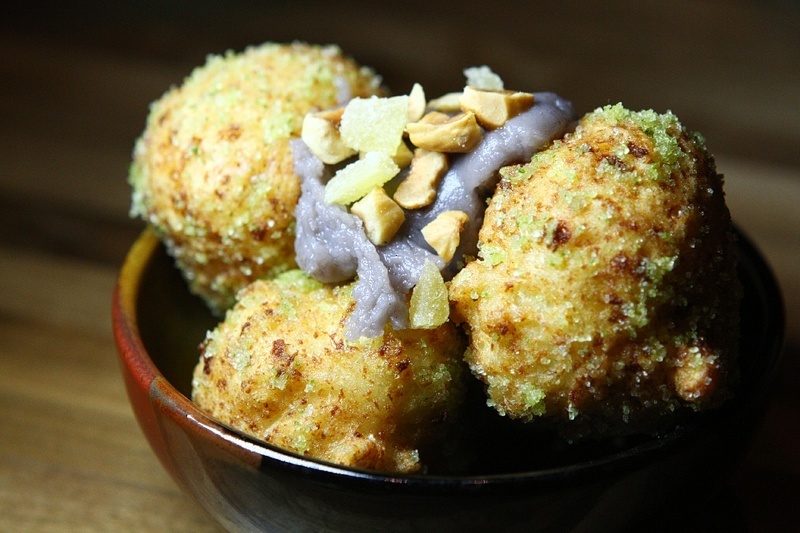 Read more about Yusho, and see the full menu, on the official Monte Carlo site. 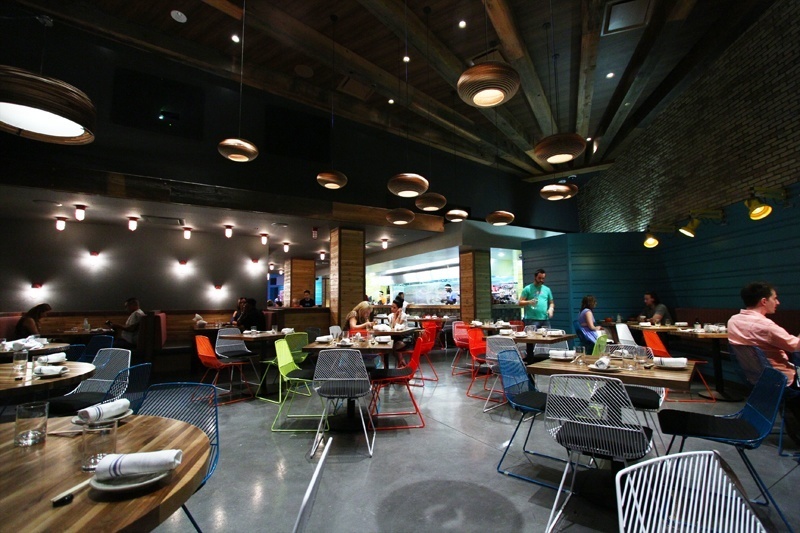 Then again, at Yusho, you don’t have to know anything about Japanese food. Just trust the people who do, and eat up. 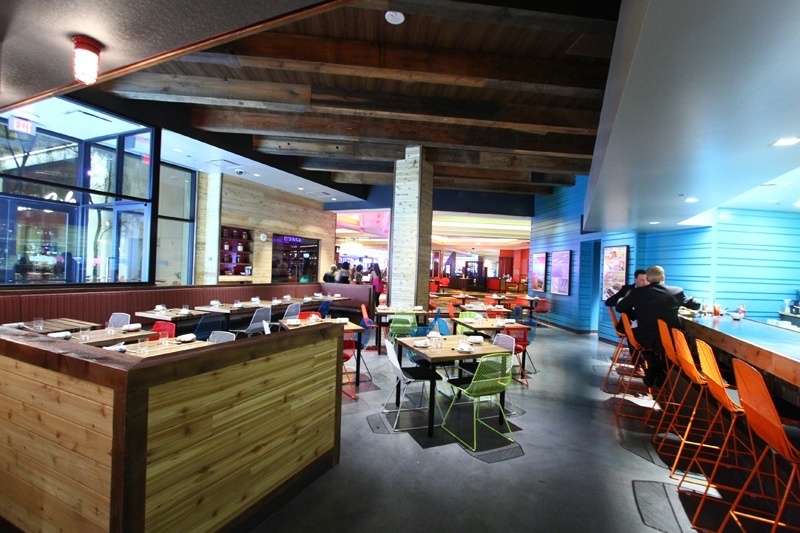 This entry was posted in Las Vegas, Las Vegas Restaurants on July 31, 2014 by Scott Roeben. 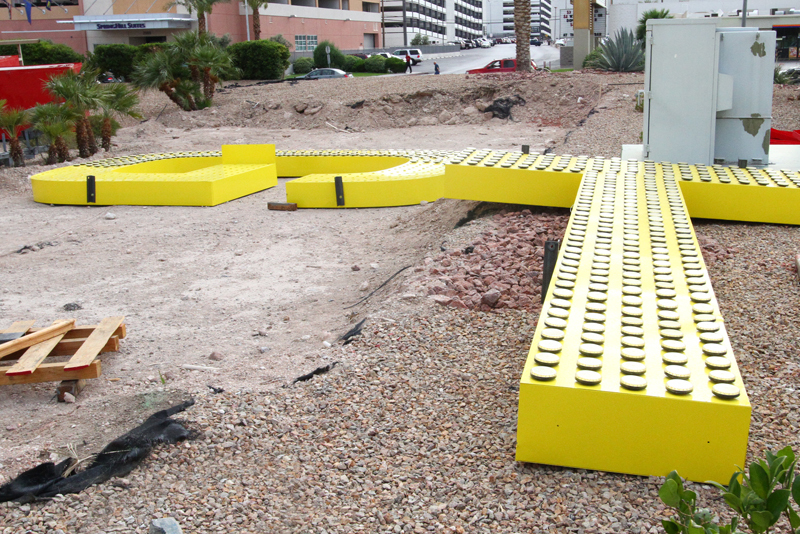 In what’s become a familiar ritual, the sign is again changing at the former Las Vegas Hotel (LVH), formerly the Las Vegas Hilton, formerly the International. Oh, the signs they are a’changin’. 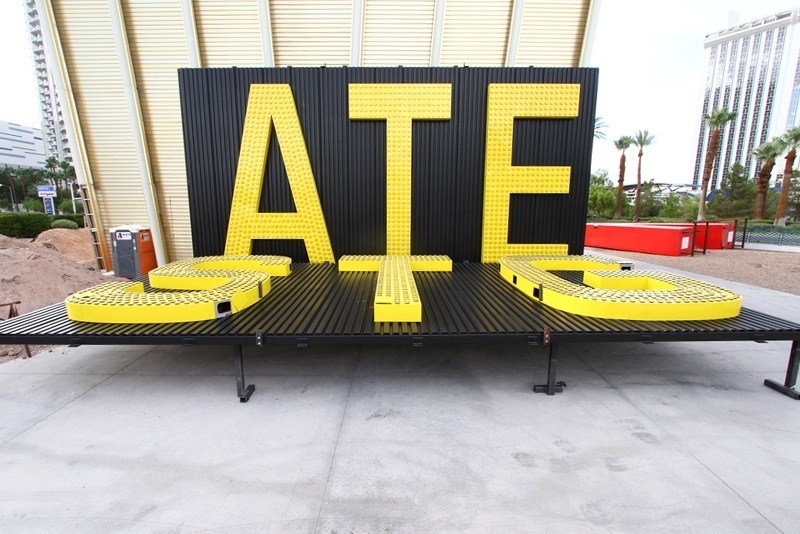 The hotel was recently purchased by Westgate Resorts, and the letters for the new Westgate sign are on-site, ready to be hoisted into place. 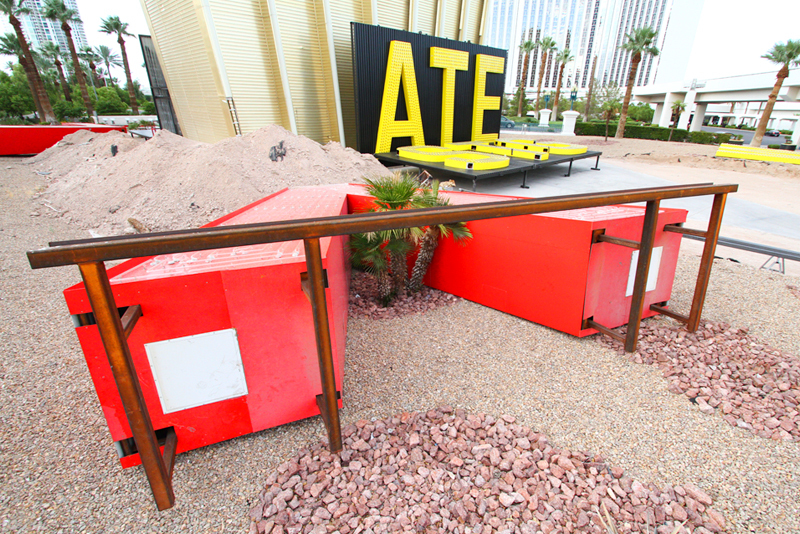 The LVH letters still haven’t left the building. 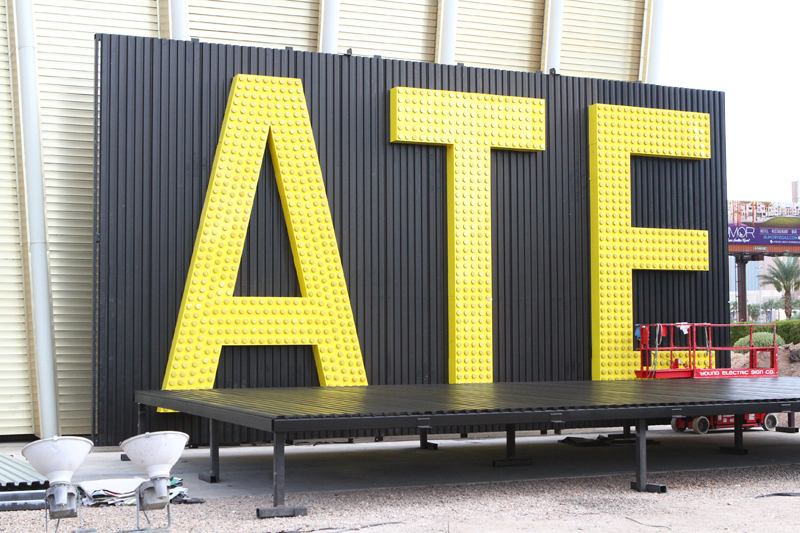 True to the rendering released by Westgate, the new sign will have no fancy font, and the lettering is yellow. It would be terrible if the installation guys screwed up and the new hotel was called “Mestgate,” wouldn’t it? 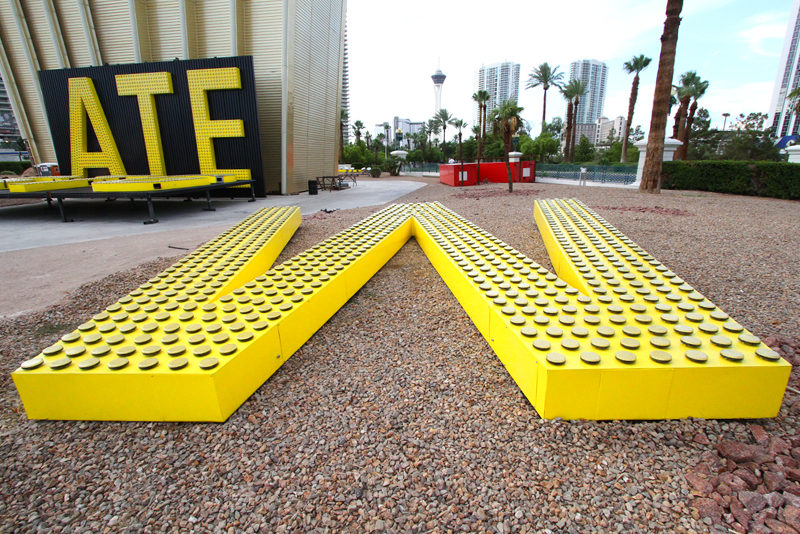 The sign will be illuminated by thousands of LED capsules. 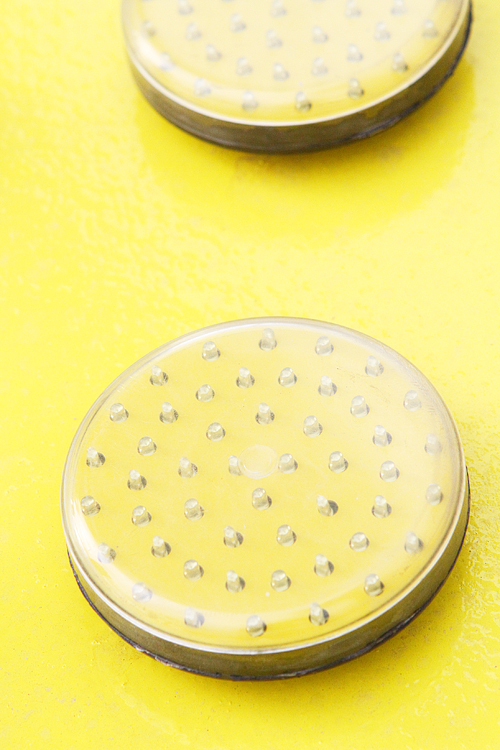 We have no idea if they’re called “capsules,” but “LED polyps” didn’t have quite the same ring to it. Related: The LED Polyps would make a great band name. 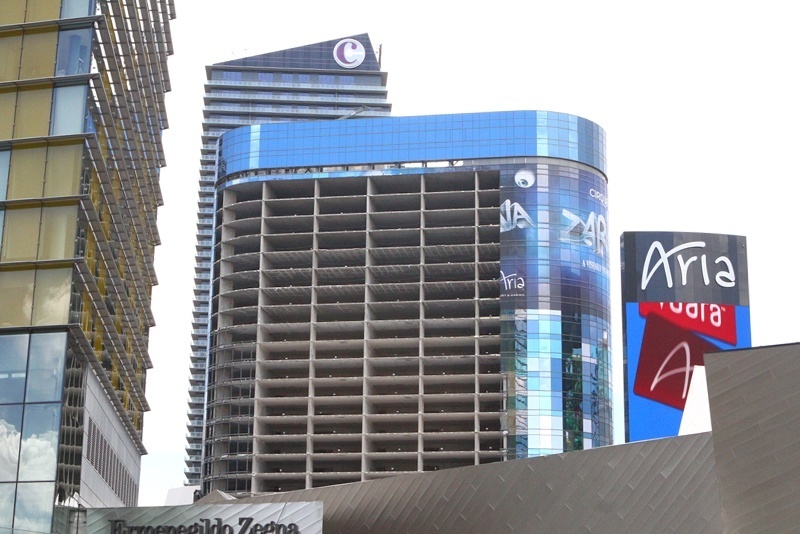 The Las Vegas Hotel was purchased for between $150 million and $170 million. Westgate, of course, is the timeshare company, although the new resort is expected to be a mix of timeshares and traditional hotel-casino offerings. The aforementioned rendering. Not a whole lot of Vegas flair happening as far as we can see. 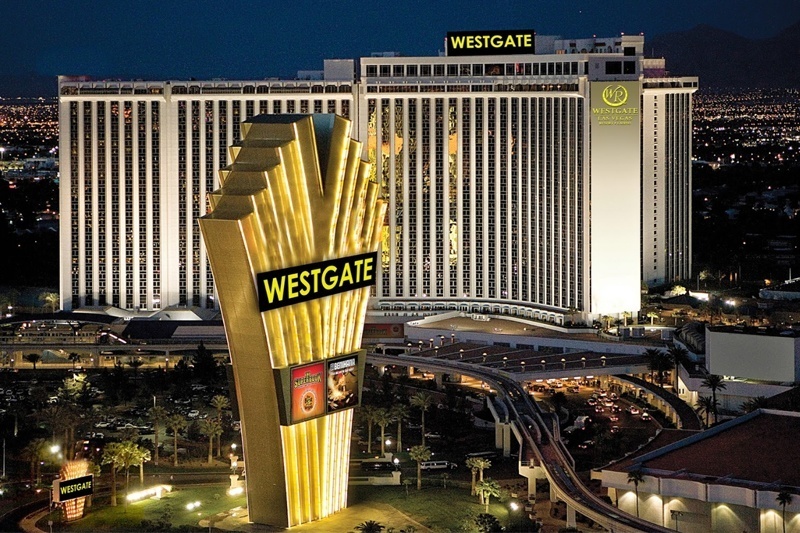 Siegel says he’ll invest a substantial amount to renovate the Westgate Las Vegas. He’s said the renovations will include the addition of a dayclub and nightclub (presumably because of the scarcity of those in Las Vegas), converting the hotel’s Shimmer Cabaret with a lounge and changing the Tempo Lounge over to a high-limit gaming area. Yes, we breached security to get these photos. Next time, we’re risking arrest for something cooler. 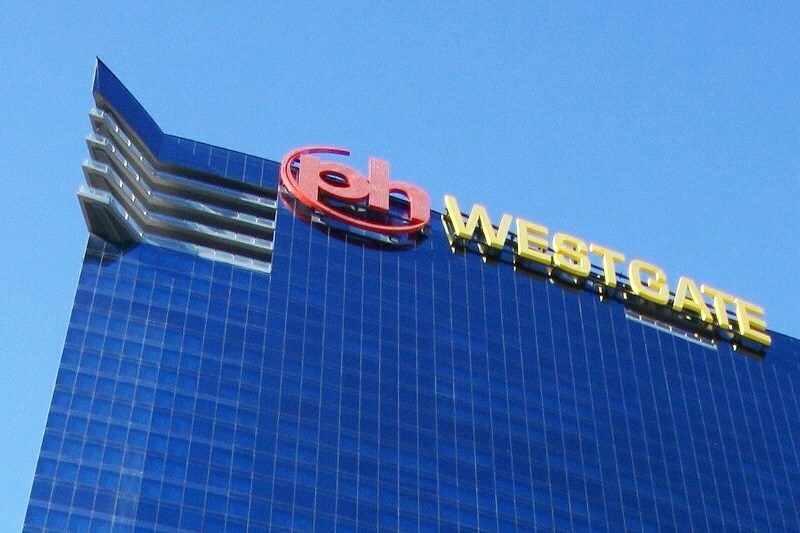 If the letters of the new Westgate sign look familiar, that’s because they were salvaged from another project in Las Vegas, the PH Towers Westgate (see below). Thanks to our friend John Katsilometes for that Vegas factoid. David Siegel lost PH Towers Westgate in a foreclosure. 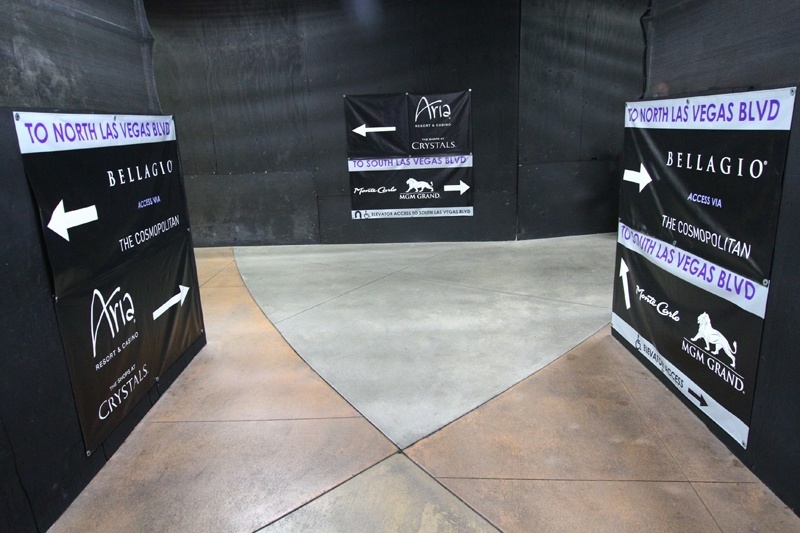 Which, we’re thinking, bodes well for Westgate Las Vegas, at least in Bizarro Rich Guy World. 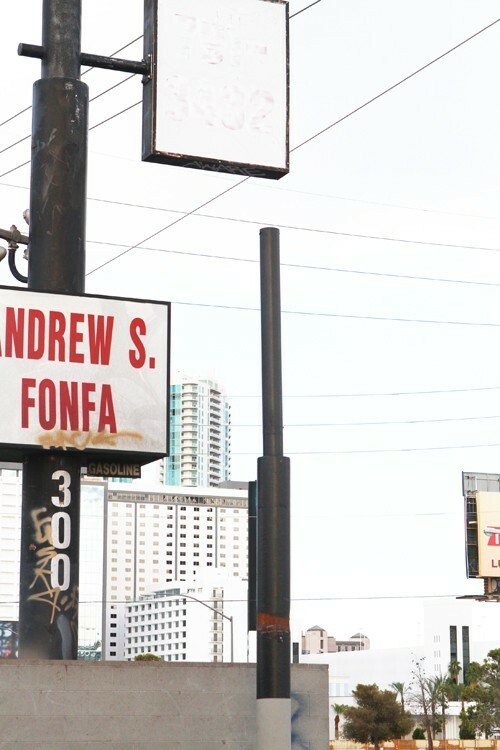 Here are more photos for the Las Vegas sign nerds, among whom this blog counts itself. 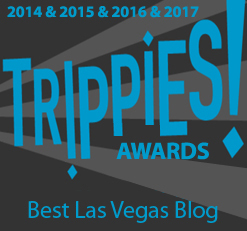 This entry was posted in Las Vegas, Las Vegas Hotels on July 28, 2014 by Scott Roeben. The Harmon tower, the never-occupied hotel in the CityCenter complex on the Las Vegas Strip, is coming down, piece by piece. 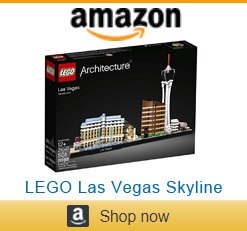 Looks like a hotel tower, right? Let’s take a closer look. 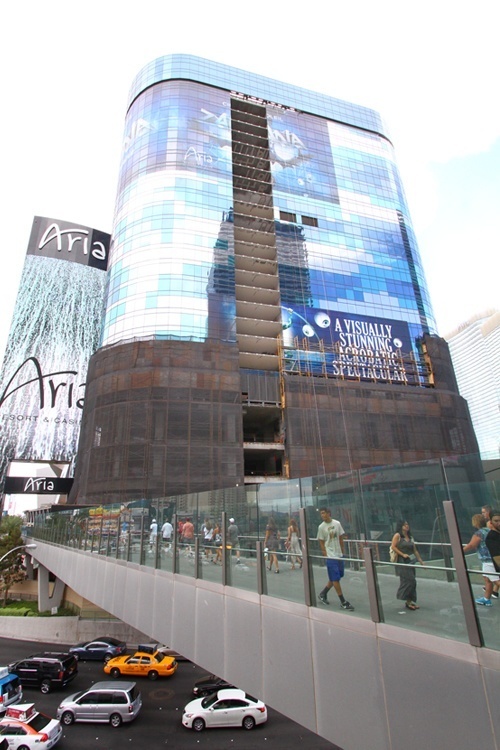 Construction was halted on the would-be Harmon Hotel, at one time called the Harmon Hotel, Spa & Residences, in 2008 (two years into the building’s construction) due to construction defects. The hotel was originally supposed to be 47 stories tall, but the existing structure is 26, 27 or 28, depending upon whom you ask. After construction stopped on the building, epic legal wrangling ensued. 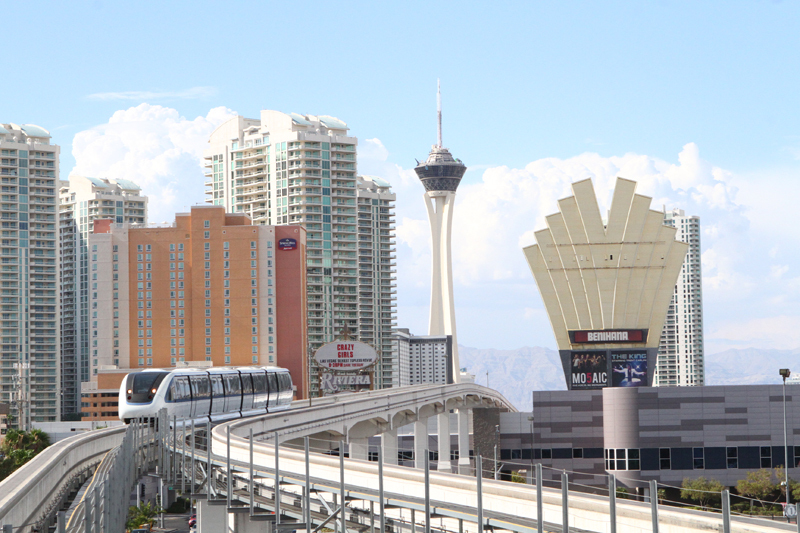 Ultimately, MGM Resorts was granted permission to take the building down. Scaffolding and mesh keeps the demolition stuff off of passersby. The lawyers are busy enough. The culprit for all this clustery goodness is a company called Pacific Coast Steel, which improperly installed critical steel reinforcements (rebar). Their screw-up resulted in a building that was deemed by engineers likely to collapse during an earthquake. So, yeah, the rebar was FUBAR. While historically hotels in Las Vegas have been imploded, due to its proximity to surrounding buildings, Harmon tower is in the throes of a year-long demolition involving gutting the structure and taking it apart in a more meticulous fashion. The demolition is expected to cost $11.5 million. It’s estimated the Harmon tower cost $275 million to build, despite it never opening. 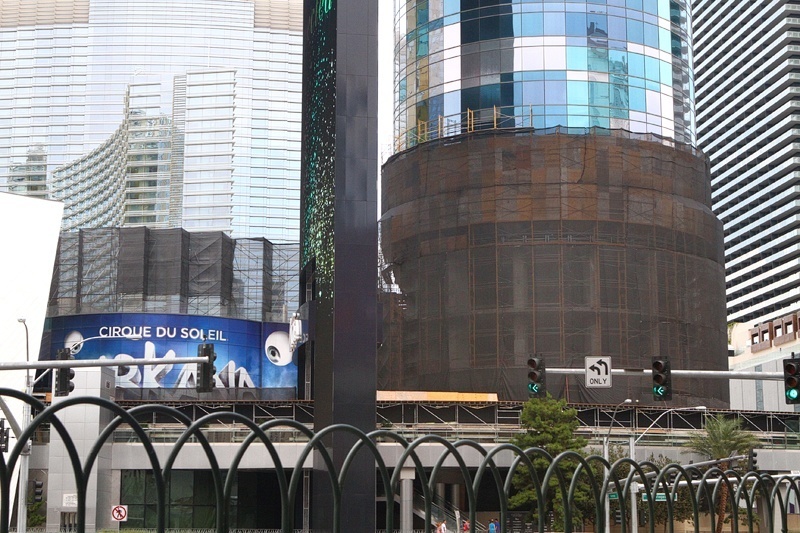 Evidence of the demolition can now be seen on the exterior of the building, dubbed by some as the “world’s most expensive billboard.” Windows are being removed on both the north and south sides of the building. The south face of the Harmon tower is nearly glassless. 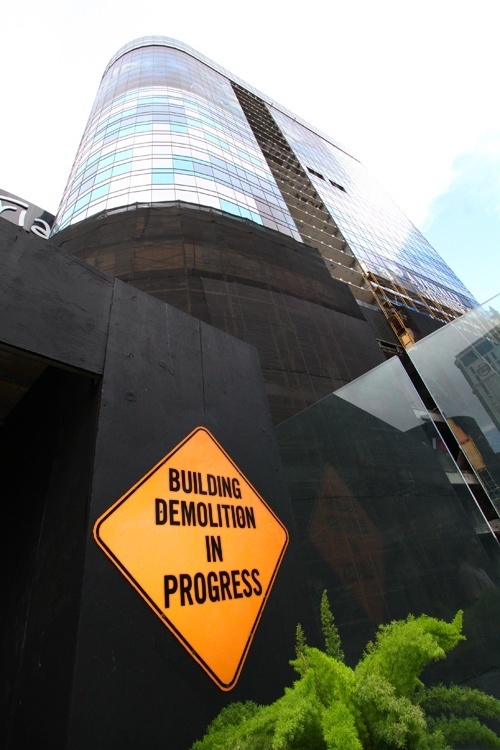 The Harmon tower demolition has made finding one’s way a little confusing around the site. 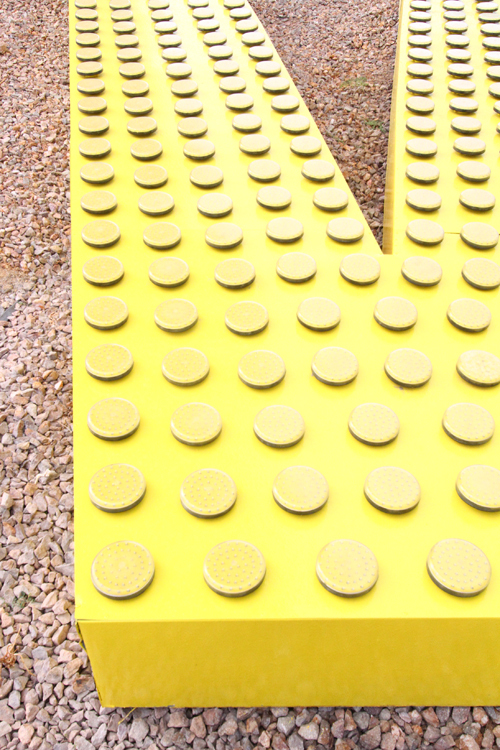 This has nothing in common with the maze from “The Shining.” Probably. 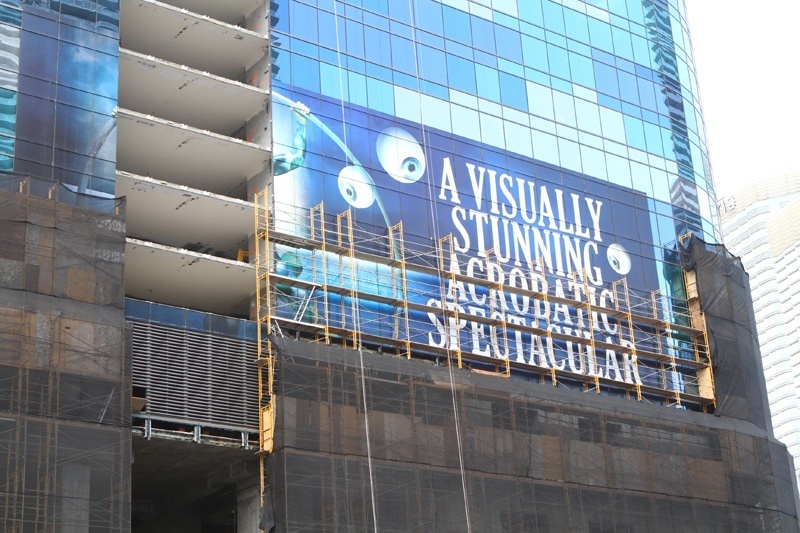 While the demolition of the Harmon Hotel is sure to leave a strange gap in the Las Vegas skyline, there’s a bright side: It was intended to be a boutique hotel, with no casino, so meh. Dibs on the sign when the Harmon comes down. 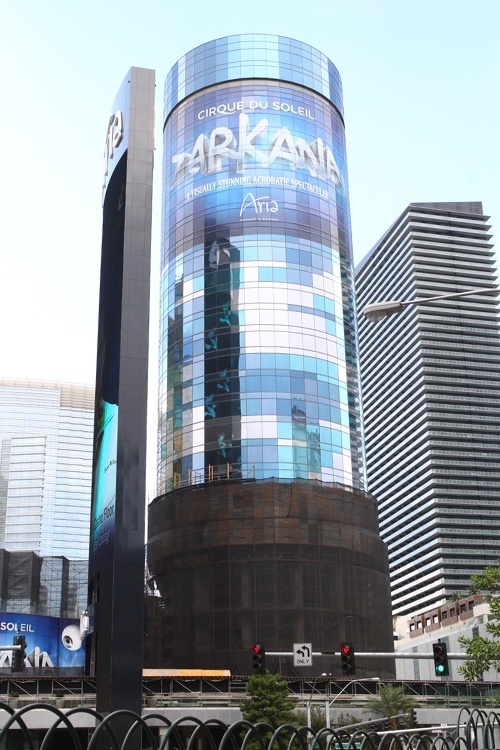 As the Harmon demolition continues, it looks like “Zarkana” is going to have to find another way to advertise. 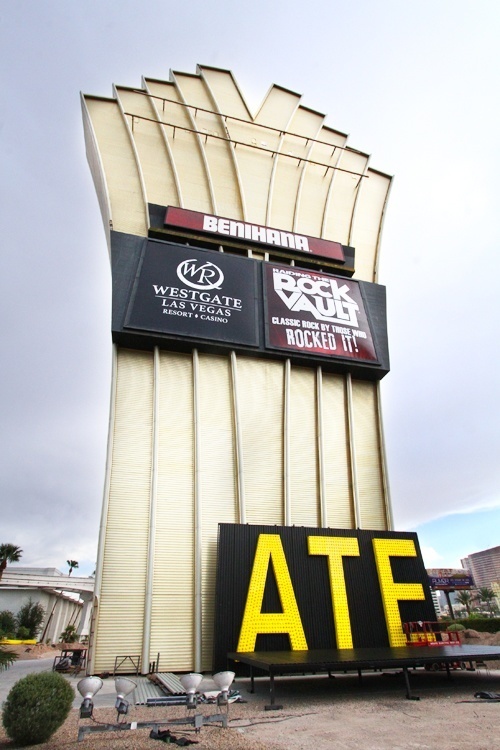 This entry was posted in Las Vegas, Las Vegas Casinos, Las Vegas WTF on July 27, 2014 by Scott Roeben. A longtime fixture in Las Vegas, the gold steer statue outside the enduring Golden Steer Steakhouse, nearly met its demise recently in a quirky accident. The gold steer has stood vigil outside the Golden Steer Steakhouse for an incredible 56 years, but was knocked from its platform when a lobster delivery truck hit the pole supporting the iconic statue. A lobster delivery truck took down the golden steer, illustrating the timeless rivalry between surf and turf. In a world exclusive, we’ve got the full story! Look, we take our world exclusives where we can get them. Apparently, on his first day on the job, a driver for the Golden Steer’s lobster supplier, the reportedly excellent Supreme Lobster and Seafood, tried to make a delivery at the restaurant’s front entrance despite the fact deliveries are typically made at the rear. The impact with the statue’s pole caused it to fall from its platform and it nearly crashed to the ground. Thankfully, the bovine’s feet got caught up in some electrical wiring and was spared oblivion. To make the story even more dramatic, the statue’s nose came to rest just an inch from the ground. Not exaggerating. When we saw this empty pole, we’ll admit to having a bit of a freak-out. Interestingly, the statue isn’t made of metal or another resilient material, but rather plaster, so there was a very real chance the statue’s number could have been up, for good. To his credit, the delivery driver immediately reported the incident to the folks at Golden Steer, and Supreme Lobster’s insurance is expected to cover the damages. For the time being, the statue is being kept in a small storage area just off the restaurant’s main dining room. 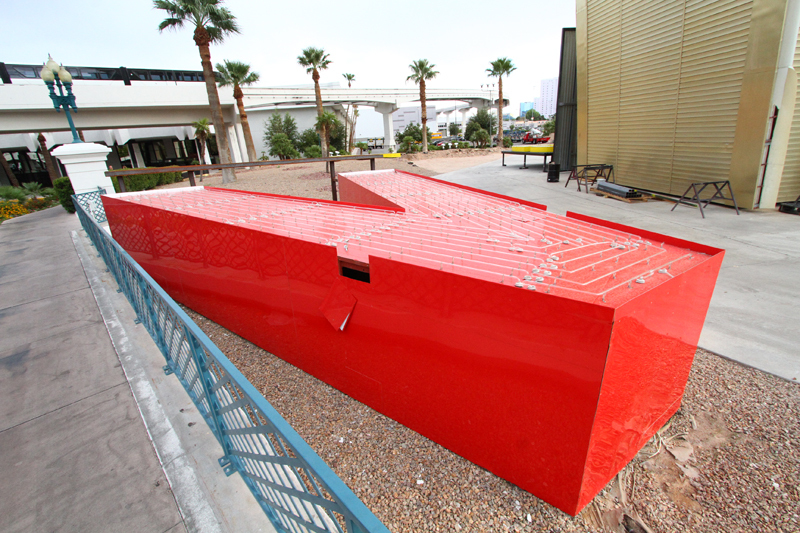 Here’s an exclusive photo of this irreplaceable piece of Las Vegas history, udderly safe and sound. Even after 56 years, the statue doesn’t have nickname. May we suggest Lucky? So, what’s next for the gold steer? Plans to resurrect the statue are taking some time. The restaurant notes the permit process to restore the sign’s electrical wiring is more complicated than it was 56 years ago, so it may take a week or two to put the statue back in its rightful place. Once he’s back, we promise to never take him for granted again! Golden Steer Steakhouse has hosted a slew of notable guests including Nat “King” Cole, Joe DiMaggio, Elvis Presley and many others. 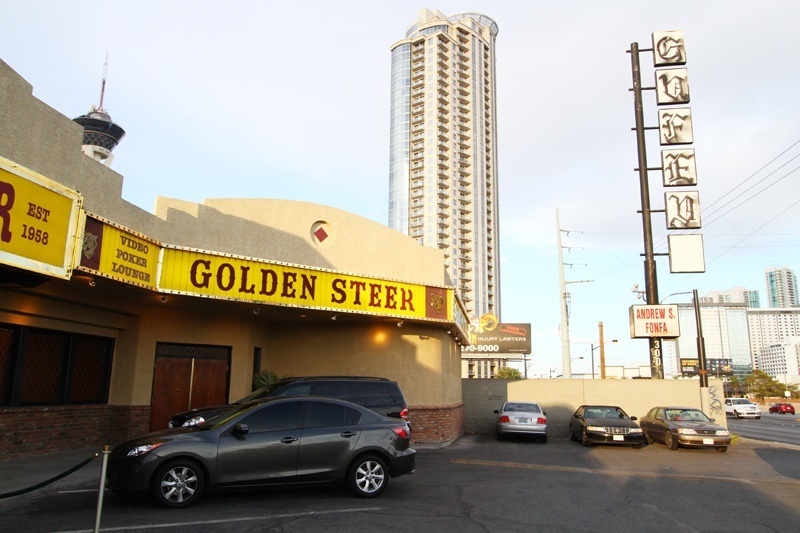 The Golden Steer Steakhouse is just west of the Las Vegas Strip, on Sahara Avenue, not too far from Stratosphere or the new SLS Las Vegas. 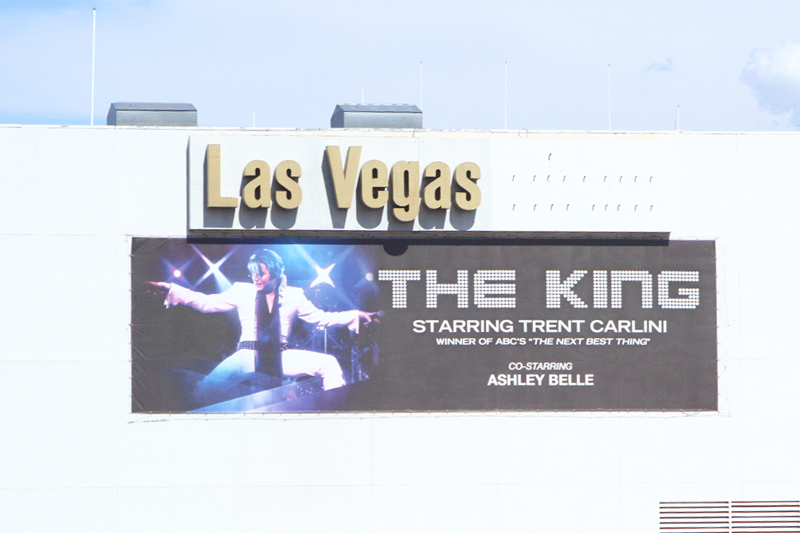 Here’s a bit more about this much-loved Vegas throwback. Find out more about the Golden Steer Steakhouse, which opened in Las Vegas in 1958, making it the oldest steakhouse in Sin City. 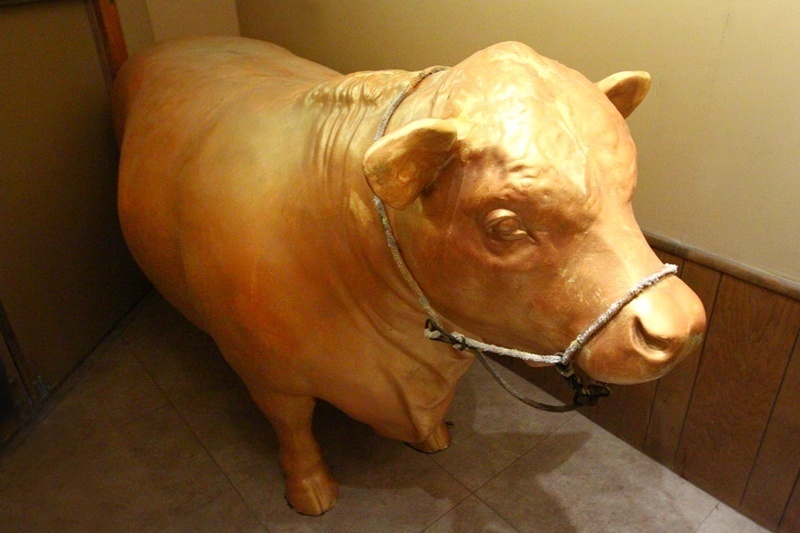 Update: The Golden Steer Steakhouse’s steer has been restored and returned. Read more. 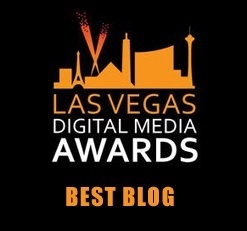 This entry was posted in Las Vegas, Las Vegas Restaurants on July 27, 2014 by Scott Roeben. We don’t make up the news, we just report it. 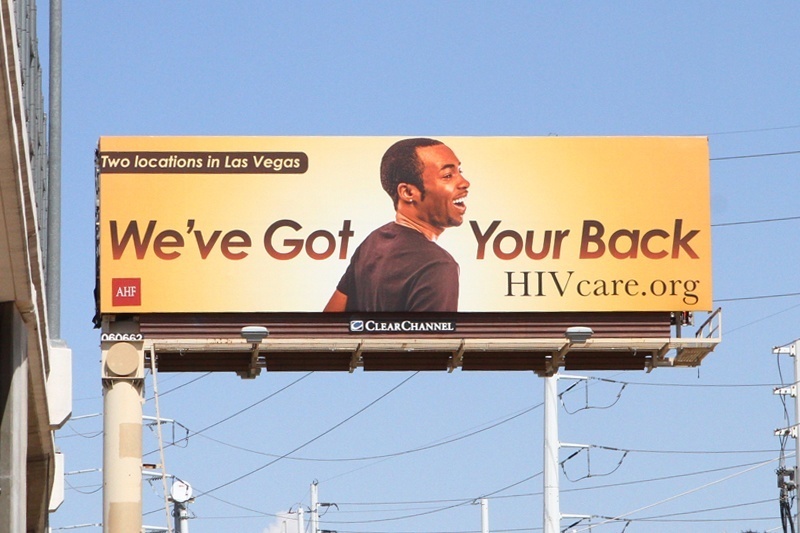 This entry was posted in Las Vegas, Las Vegas WTF on July 27, 2014 by Scott Roeben. 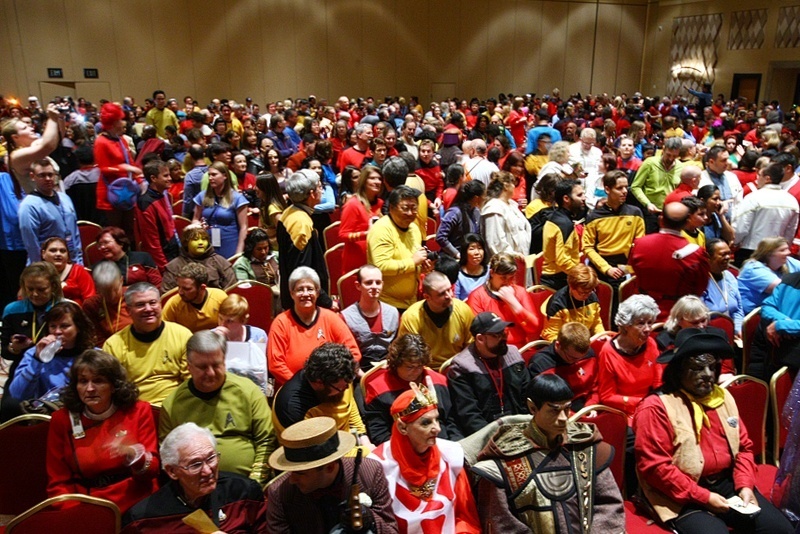 The official “Star Trek” convention will be back in Las Vegas, July 31 through Aug. 3, 2014, and it’s easily one of the most quirky, enjoyable Sin City gatherings of the year. We’ll assume we have your attention. The “Star Trek” legacy is alive and well, as this annual convention expects more than 15,000 Klingons, Vulcans and other life forms to attend the festivities at Rio Las Vegas. The four-day event will feature appearances by four “Star Trek” captains: William Shatner (yes, that one), Scott Bakula (“Star Trek: Enterprise”), Avery Brooks (“Star Trek: Deep Space Nine”) and Kate Mulgrew (“Star Trek: Voyager”). 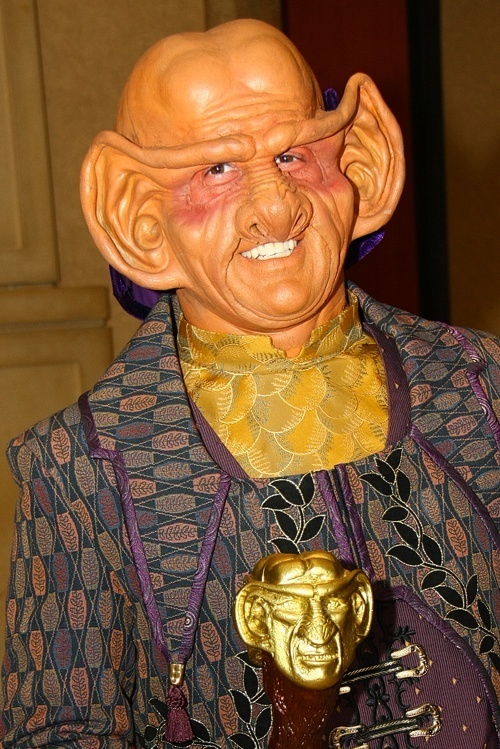 The Ferengi first made contact with the United Federation of Planets in 2364 on the planet Delphi Ardu. Related: What is wrong with us? A slew of other celebrities will be on hand, including Walter Koenig and Nichelle Nichols. The “Star Trek” convention will also have panel discussions, trivia contests, collectible auctions as well as an exhibit hall where fans can purchase “Star Trek” and sci-fi goodies. 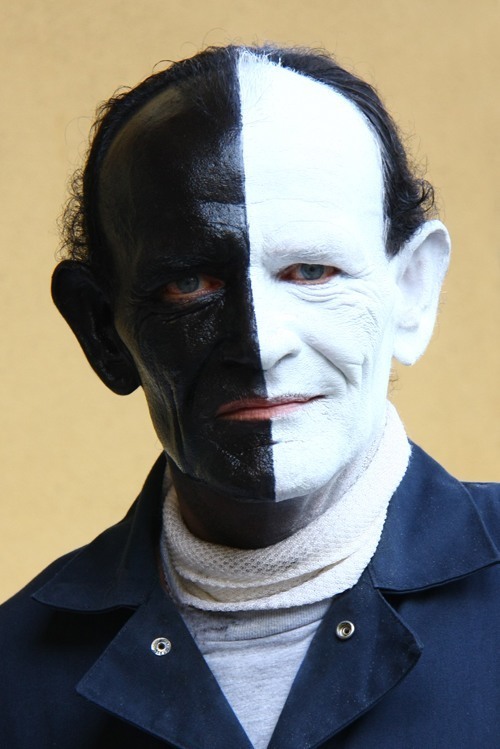 On Aug. 2, more than 2,000 attendees are expected to attend in costume. Trust us, these folks are really, really serious about their “Star Trek” costumes. This blog was there when the world record was broken for “Most People Dressed Up in ‘Star Trek’ Costumes,” and we don’t care who knows it. Hanging out with thousands of people this enthusiastic about anything is an absolute blast. If you didn’t immediately think of “Let This Be Your Last Battlefield,” you should be ashamed of yourself. To find out more or to purchase tickets, visit the convention’s official site. Oh, just stop your judging and come join in the fun, already. 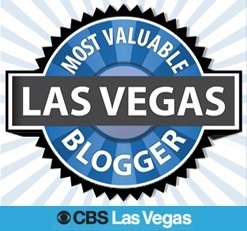 This entry was posted in Things to Do in Las Vegas on July 22, 2014 by Scott Roeben.